Will the religious confrontations with secular authorities around the world lead to a new Cold War? Mark Juergensmeyer paints a provocative picture of the new religious revolutionaries altering the political landscape in the Middle East, South Asia, Central Asia, and Eastern Europe. 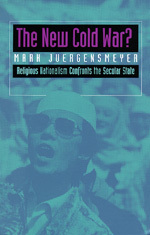 Impassioned Muslim leaders in Egypt, Palestine, and Algeria, political rabbis in Israel, militant Sikhs in India, and triumphant Catholic clergy in Eastern Europe are all players in Juergensmeyer's study of the explosive growth of religious movements that decisively reject Western ideas of secular nationalism. Juergensmeyer revises our notions of religious revolutions. Instead of viewing religious nationalists as wild-eyed, anti-American fanatics, he reveals them as modern activists pursuing a legitimate form of politics. He explores the positive role religion can play in the political life of modern nations, even while acknowledging some religious nationalists' proclivity to violence and disregard of Western notions of human rights. Finally, he situates the growth of religious nationalism in the context of the political malaise of the modern West. Noting that the synthesis of traditional religion and secular nationalism yields a religious version of the modern nation-state, Juergensmeyer claims that such a political entity could conceivably embrace democratic values and human rights. Mark Juergensmeyer is Professor of Sociology at the University of California, Santa Barbara. He is the editor of Violence and the Sacred in the Modern World (1992) and the author of Radhasoami Reality: The Logic of a Modern Faith (1991) among other books.